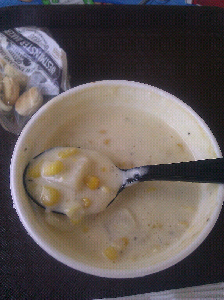 Well, actually, the sign says "chowda" - fresh Vermont corn and potatoes in a thin cream broth. At the Country Creemee, a roadside snack bar just north of Springfield, Vermont. I remember going to that creemee stand. Guess you survived the guy running it. Great looking soup!